DAVENPORT was requested to provide engineering and environmental services support for this Safe Routes to School (SRTS) project. The project included the installation of approximately 2,700-feet of sidewalks located on the east and west side of Highway 194 (Jefferson Street) in Boone, NC. DAVENPORT’s scope of work included conducting a transportation study for the existing school according to MTSA Standards, providing traffic control plans, reviewing the existing roadway design for adherence to NCDOT Standards, providing pavement marking plans, and attending public involvement meetings. In addition, DAVENPORT provided environmental services. The project was federally funded, and therefore, the National Environmental Policy Act of 1969 (NEPA) applied. Environmental services included the preparation of a NEPA Type-I Categorical Exclusion (CE) document. DAVENPORT performed on-site investigations to identify environmental features located within a 250-foot radius of the project area. 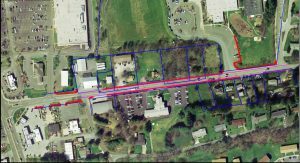 In addition, DAVENPORT utilized Geographic Information Systems (GIS) data to perform a cursory environmental screening of the project area to identify potentially direct, secondary and cumulative environmental impacts due to the project design alternatives. DAVENPORT conducted extensive research for the preparation of the CE and coordinated with federal and local agencies, as required. DAVENPORT prepared a CE document that detailed the purpose and need for the project, the proposed improvements, and provided additional supporting documentation as required. DAVENPORT received approval for a Type-I CE.